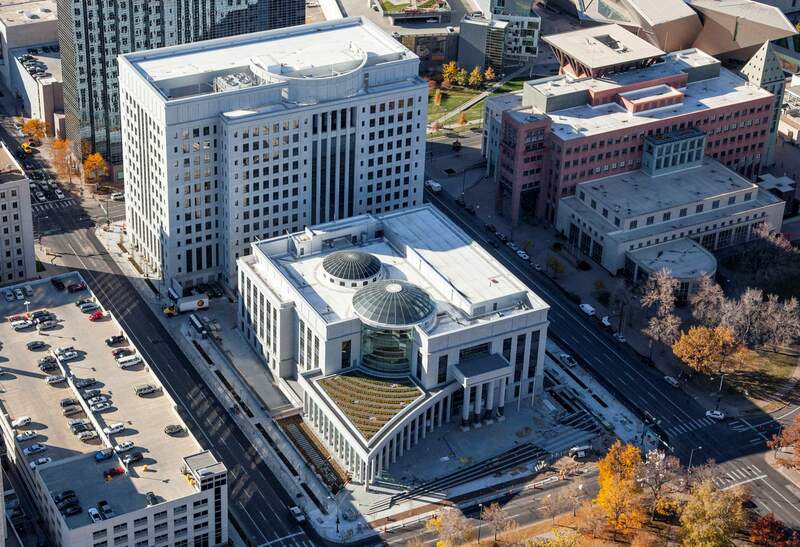 The Ralph L. Carr Colorado Judicial Center sits across the street from the state Capitol in downtown Denver and houses the Court of Appeals and Colorado Supreme Court. DENVER – Another step was taken in resolving construction defects litigation in Colorado, but there’s dispute over whether that step was forward or backward. At issue is a Monday ruling by the state Supreme Court that upheld a developer’s right to require mandatory arbitration for any defects claims. The 27-page ruling for Vallagio V. Metro. Homes stipulates that a developer may include provisions in a Common Interest Communities (CIC) declaration that gives it the right to refuse any amendments voted on by homeowners. A CIC is a legal definition for communities that are assessed mandatory fees and are overseen by a homeowners association. Examples include Edgemont, Falls Creek and Dalton ranches. Ken Golden, a Durango real estate attorney, said CIC declarations are generally created by developers before units are sold. They can include things such as guidelines for modifications of units and procedures for how common elements, such as roads or amenities, will be funded and managed, he said. In the lawsuit, homeowners voted against a section of their declaration that required them to enter into binding arbitration for defects claims. Statute allows CICs to gather a majority vote to change declarations laid down by developers. The level of majority required varies between declarations but cannot exceed 67 percent. The CIC in Vallagio V. Metro. Homes argued that requiring consent from developers for changes exceeded the maximum limit and should be prohibited. But the 5-2 ruling found the inclusion of a consent requirement does not violate the statute concerning declaration changes. Rep. Alec Garnett, D-Denver, who worked on defects bills during the 2017 legislative session, said the ruling, combined with the efforts of the Legislature, could bring some stability to Colorado’s condominium market. But time is needed for it to play out. “It would not be wise for us to immediately start opining about what we’re going to do next session, because all that’s going to do is continue the environment of uncertainty that has bogged this market place down for a very long time,” Garnett said. Build Our Homes Right, a homeowners advocacy group, had a different opinion of the ruling and its implications. Jonathan Harris, CEO of Build Our Homes Right, said in a statement that the ruling diverges from what should be a priority for courts: protecting citizens’ legal rights, such as the right to trial. “The court just decided that deep pocketed developers have the right to steamroll over homeowners in order to shirk their responsibility for producing shoddy homes,” Harris said. He added that the implications of the ruling stretch beyond defects. “The court has decided that powerful developers can control homeowners associations until the end of time, not only in construction defect claims, but on everything from their right to a jury trial in any kind of dispute, to issues relating to assessments and how homeowners use their own homes,” he said. Garnett said some groups believe the ruling puts developers in the driver’s seat, but he was not willing to jump to conclusions. “We’re just going to have to wait and see what actually happens,” Garnett said. He added that the ruling does not require binding arbitration for all defects claims, but rather reinforces that CIC declarations should be seen as contracts. That is something Golden said is vital for prospective buyers to understand. “The declaration is a contract. You have the ability to review the recorded declarations before you buy in that subdivision, and if you don’t like the terms, you don’t have to buy there, and if it’s something that’s not going to be able to be amended, you need to be aware of it ahead of time,” he said. Arbitration can be preferable to a lawsuit because of the investment of time and resources going to court requires when multiple defects are involved, Golden said. “Construction defects litigation is expensive – it’s frightfully expensive, unfortunately,” Golden said. Because each defect must be discussed on its own merit with experts from both sides, court cases can take time and rack up additional costs, while arbitration may limit the time for presenting and arguing a case based on the regulations outlined in the declarations, he said. The potential limitations that developers can put on arbitration has caused homeowner advocacy groups to fight for removing required arbitration in legislation and CIC declarations. Harris said the limitations can include: choosing the arbitrator; moving the process out of state, making it difficult and costly for owners to attend; and limiting the amount of restitution homeowners can seek, even if it doesn’t cover the costs of repairs. Garnett, however, said arbitration is a respected form of dispute resolution and should not be seen as the state government giving a free pass for companies to carry out bad building practices. “No one wants to protect bad builders,” he said.